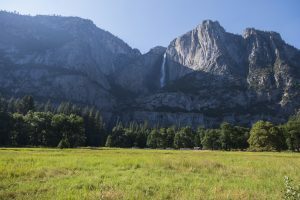 This level, paved loop through the meadows of Yosemite Valley allows you to see many of Yosemite’s towering icons such as Yosemite Falls and Half Dome. Start at the Visitor Center and follow the bike path west through the valley’s tall, lovely trees over to the Lower Yosemite Fall shuttle stop (#6). Cross the street and continue on the bike path out to the middle of the meadow where you stare up at Sentinel Rock. Turn around to see Yosemite Falls crashing to the valley floor. Continue on the loop, staying left as the trail forks, to the Sentinel Bridge shuttle stop (#11). Make the short side trip to the bridge to see the Half Dome before returning. Take the boardwalk as it continues looping through the meadow where you’ll cross the street and head back to the Visitor Center. Trailhead: The hike begins at the Yosemite Valley Visitor Center.